The Flying Dutch posted their 500th victory under veteran coach Karla Wolters in dramatic and celebrative style on Wednesday, March 24, in Florida. The longtime Hope coach has announced she will retire from teaching and coaching at the end of this season. Her 500th Hope coaching victory came in a 5-4 victory over Grinnell, Iowa at the National Training Center in Clermont, Fla.
Tied 4-4 in the bottom of the seventh inning, sophomore Stephanie Faber hit a single and advanced to second on a sacrifice hit by Abby Phillips. Junior Suzie Stevenson followed with a single and coach Wolters from her familiar third base coaching position waved the baserunner home where she was safe on a close play. The Flying Dutch gave Wolters her first-ever post-game Gatorade shower and the former softball Olympian Dot Richardson, who is director of the National Training Center where the game was played, presented her with the game ball. Hope had opened the day with a 6-0 victory over Washington and Jefferson, Pa behind a one-hit pitching effort by junior Michelle Marra. The sweep extended Hope's winning streak to three in-a-row and puts the Flying Dutch at 5-5 in Florida. The team heads begin their regular season Saturday with games to be played in Wheaton, Ill. The team's first home games will be Saturday, April 3, against MIAA rival Alma. 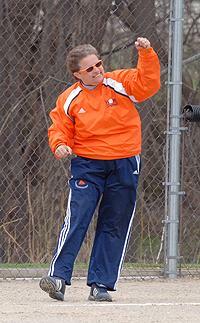 Coach Wolters is in her 36th year of coaching, the last 23 as Hope's head softball coach. Her coaching record at Hope is 500-302 and her career mark is 669-380. She ranks as the fifth winningest coach alltime in NCAA Division III. Hope College junior Carrie Snikkers has been nominated as a candidate for the 2009-2010 Division III Athlete of the Year representing basketball.